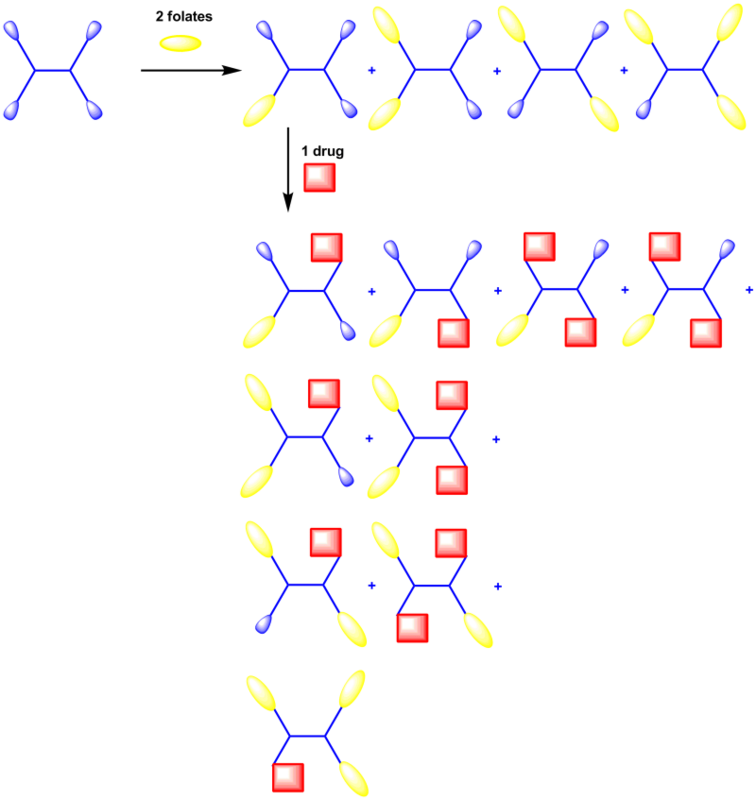 Poly(amidoamine) Dendrimers (PAMAM Dendrimers) are branched synthetic polymers that were first discovered by Dr. Donald A. Tomalia in the late 1970s , with excellent control over size and highly mono-disperse materials. In the last 20 years, the interest of the scientific and biotechnology communities has grown exponentially. The number of manuscripts published has increased from a single publication in 1990 to 625 publications in 2011, with patent applications filed with the U.S. Patent Office following a similar trend. This trend reflects an increasing belief that dendrimers have considerable potential for applications across a range of technologies, including nanomedicine, contrast imaging delivery, and nucleic acid delivery [2-4]. Despite the increasing number of patent and non-patent publications, no systemic dendrimer-drug conjugates have entered clinical trials testing since its discovery. This may be due to an issue of manufacturing and controls of a dendrimer-drug conjugate. Standard dendrimer conjugation chemistry produces an average of a mixed number of species of products. For instance, when standard dendrimer conjugation chemistry occurs, a mixture of products is formed (Fig. 1). This makes it very difficult to isolate one species of product to proceed with clinical trial materials. This mixed number of species of products may be a shortcoming for systemic dendrimer-drug conjugates, which currently prevents them from reaching their full potential. Fig. 1. A schematic representation of a dendrimer with 2 folates conjugation followed by a drug conjugation. The conjugations generate a mixture of products. Fig. 2. A schematic representation of our proprietary N-Boc-SMMS Technology (Pat. Appl. No. PCT/US2013/056909). In 2012, National Cancer Institute estimated 22,280 new cases and 15,500 deaths from ovarian cancer in the United States. Currently, ovarian cancer is the fifth biggest cause of cancer-related death in women. Over recent decades, significant improvements have been made in treatment outcome in terms of response rate and survival. To date, intensive surgical staging and cytoreduction, followed by primary chemotherapy with the carboplatin-paclitaxel regimen, are considered the gold standard for the management of this disease . Approximately 15% of women present with disease localized to the ovaries and in this group with full staging surgery the 5-year survival is greater than 90% . However, the majority of women present with advanced disease stage and their 5-survival is less than 30% . Recently, research scientists have attempted to use an additional cancer drug with the carboplatin-paclitaxel regimen to improve efficacy. However, the results have not been successful. For instance, addition of epirubicin, one of anthracyclines, to the standard carboplatin and paclitaxel treatment did not increase the survival rate in patients with advanced ovarian, tubal or peritoneal cancer due to serious hematologic and non-hematologic toxic side-effects (Grades 3-4) . To improve toxic side-effects and efficacy of the platinum-based drugs, some focused on the improvement of intracellular uptake of platinum-based drugs by varying structures of ligands chelating on the platinum drugs , and others focused on nano-formulation of their platinum drug . Yet, those studies are in early stages of development and lack prediction and guidance towards effective and safe therapies. At Annam Biosciences, we are developing a portfolio of cancer receptor-targeted drugs and imaging contrast agents by utilizing our proprietary technology. Our technology can deliver an ease of manufacturing of drug conjugates by precisely controlling of the number of drugs and/or imaging agents with the desired number of targeting ligands. With the novel technology, we strive to deliver the first-in-class cancer companion in vivo diagnostics (cancer-targeted imaging-based guided and/or predicted cancer-targeted anticancer drug conjugates towards the sites of cancer targets﻿) for the safe and effective use of a cancer therapeutic product﻿﻿ with a hope to reduce toxic side effects of the anticancer drugs and improve the lives of cancer patients. Tomalia DA. Interview: An architectural journey: from trees, dendrons/dendrimers to nanomedicine. Interview by Hannah Stanwix. Nanomedicine (Lond). 2012, 7(7):953-6. Patri AK, Majoros IJ, Baker JR. Dendritic polymer macromolecular carriers for drug delivery. Curr Opinion Chem Biol. 2002, 6: 466–471. Tomilia DA. Birth of a new macromolecular architecture: dendrimers as quantized building blocks for nanoscale synthetic polymer chemistry. Prog Polymer Sci. 2005, 30: 294–324. Lee CC, Mackay JA, Frechet JMJ, Szoka FC. Designing dendrimers for biological applications. Nature Biotech. 2005, 23: 1517–1526. Marchetti C, Pisano C, Facchini G, Bruni GS, Magazzino FP, Losito S, Pignata S. First-line treatment of advanced ovarian cancer: current research and perspectives. Expert Rev Anticancer Ther. 2010, 10(1):47-60. Raja FA, Chopra N, Ledermann JA. Optimal first-line treatment in ovarian cancer. Ann Oncol 2012, 23 (suppl 10): x118-x127. Lindemann K, Christensen RD, Vergote I, Stuart G, Izquierdo MA, Kærn J, Havsteen H, Eisenhauer E, Ridderheim M, Lopez AB, Hirte H, Aavall-Lundquvist E, Vrdoljak E, Green J, Kristensen GB. First-line treatment of advanced ovarian cancer with paclitaxel/carboplatin with or without epirubicin (TEC versus TC)--a gynecologic cancer intergroup study of the NSGO, EORTC GCG and NCIC CTG. Ann Oncol. 2012, 23(10):2613-9. Park GY, Wilson JJ, Song Y, Lippard SJ. Phenanthriplatin, a monofunctional DNA-binding platinum anticancer drug candidate with unusual potency and cellular activity profile. Proc Natl Acad Sci U S A. 2012, 109(30):11987-92.